Fancy an afternoon soaking up the sun, while sipping on some traditional Spanish cava? Then why not step aboard your own private chartered yacht for the afternoon. Take a cruise around the shore line of Barcelona, while enjoying the sites and sun. Why not take a dip in the Mediterranean and don’t forget to bring your swimwear! 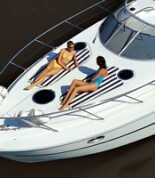 Your luxurious ride in the sun last up to 2.5 hours and includes tasty traditional tapas and beer/cava. You will also have your own translator tour guide and captain on board!